Is the lightest double-wall tent in the World worth every penny of its price tag? The less weight you carry when hillwalking, the easier the journey. And, as tents spend most of their time in your rucksack it seems obvious to cut out as much weight as possible from your tent, doesn’t it? Over recent years, Terra Nova has held the Guinness World record for a number of its tents being super-light. For 2018, it has released the Laser Pulse Ultra 1, which the brand claims is the lightest double-wall tent in the world. On the Trail scales, the tent weighed in at 501g, including all the guy lines, stuffsacks and pegs that come with it. That’s less than many waterproof jackets. If that doesn’t impress, try this – this tent’s packed size is only a touch bigger than an iconic Sigg one-litre water bottle. The Laser Pulse Ultra 1’s low weight is predominantly thanks to its Ultra Fabric, which is a nylon so thin you can see your hand through it. However, it does also carry a 10-metre hydrostatic head, so it is waterproof. Like many extremely lightweight outdoor products, the Laser Pulse Ultra 1 is designed for adventure racing, but these days you will, of course, spot plenty of adventure racing gear popping up on the summits of British mountains of a weekend, as well as speeding effortlessly over long distance paths. Indeed, anyone attempting to complete the Scottish Munros will welcome carrying less weight, so that those more remote summits can be bagged, along with their neighbours, on a weekend ultra hike. Impressive, but can the weight alone justify the hefty cost? The price tag is just under a grand, which is the same price as a 2005 Ford Focus I spotted online today. Can it satisfy the more demanding needs of hillwalkers and backpackers who just want to carry less weight? I took the Laser Pulse Ultra 1 into the Lake District along with other lightweight items of kit. 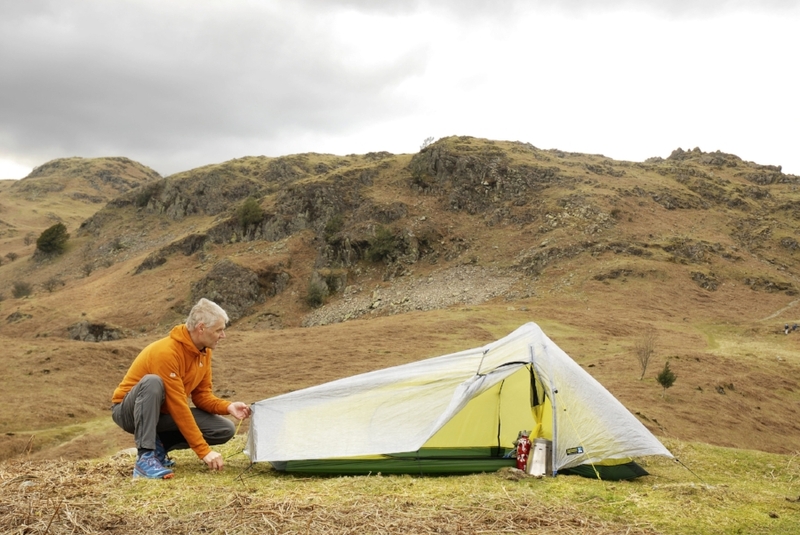 Pitching started out more easily than anticipated, as the single pole has been cleverly pre-attached to the inner tent so you can pitch the inner and outer in one go. A short pole is fitted at the foot end to create extra space, but then you have to fiddle with the eight titanium wire pegs – and this is where things go a little wrong. I have never liked these thin wire pegs, as they bend easily and tend to catapult out if not shoved fully home while under tension or if the tent is buffeted by wind. So, for me, the first thing any user will need to do is buy some proper pegs! I used the tent in the wind and on some uneven wild fell but it would be easier to pitch on a grassy valley campsite in calmer conditions. Like many extremely lightweight tents, the pegs attach to elastic cords so you don’t get ladder lock adjustment on webbing, as that would be too heavy. This does limit where you can place the pegs, so again this is best pitched on relatively good grass surfaces so you are not having to try to find gaps between rocks when placing pegs. Once pitched, the size of the inner is very good for such a lightweight tent and I could put a sleeping bag and rucksack inside easily, as well as just about sit up to access the porch. The porch area outside the door is fine for a pair of shoes and some wet waterproofs. However, this area is not that well protected. The fly does not hug the deck as well as you might expect, so in windy or wet weather, water does tend to get into the porch. Stability was not great in a blustery open fell pitch. These conditions challenged the ability of the wire pegs to stay in the ground, as well as causing the flysheet to flex a lot. So, again, it may be best used on sheltered sites, rather than anything too exposed. So, yes there are drawbacks, but I could live with those if I added proper pegs. It’s a good lightweight option for tanking around a big group of Munros or doing a long distance path, where conditions were expected to be favourable. For adventure racing, the weight and packed size are the key benefits of this tent and no doubt, in that situation, the peg issue is tolerable, As is the stability, as it will only be for a night or two. But for normal, lightweight backpacking, other tents are often light enough, and have features that ensure the night is hassle-free and comfortable. Plus, of course, there are a plethora of tents with lower price tags. For many hillwalkers and backpackers, the reduction in weight won’t justify the reduced performance and high price. But I guarantee there will be the odd trip where you’ll be wishing you’d swapped your 1kg beast out for this barely-there companion. Stunning weight and packed size for adventure racing, but it performs best in sheltered areas, so regular backpackers may be wishing for more than just the weight benefit when contemplating the price tag.